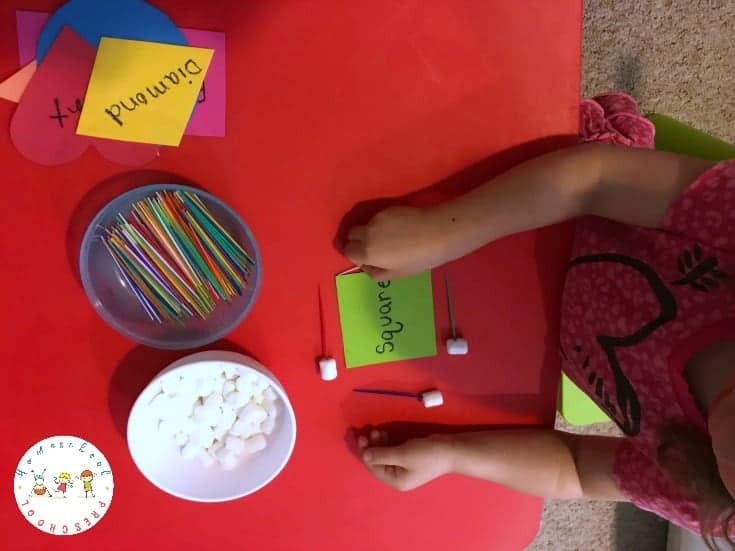 Incorporate STEM into your homeschool preschool lessons. 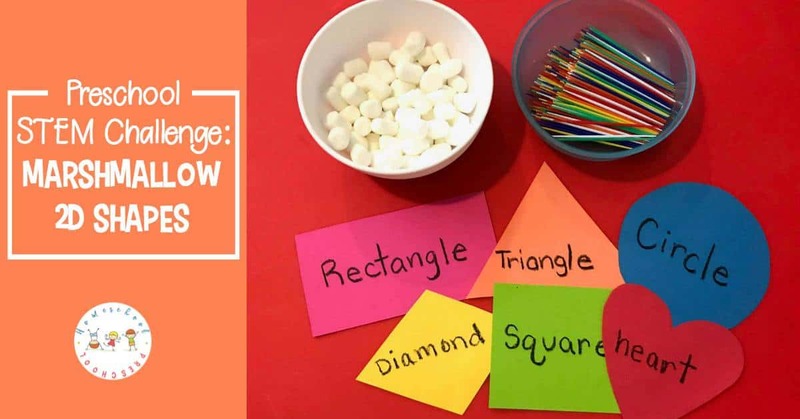 Kids will enjoy building shapes with marshmallows and toothpicks for hands-on math practice. My daughter Grace is totally obsessed with shapes! 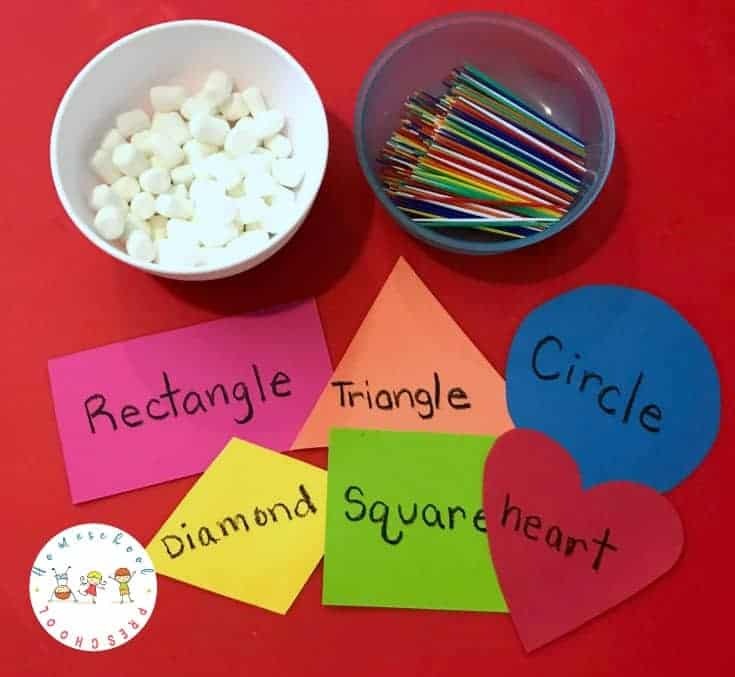 She points them out everywhere we go and when I ask her what she wants to learn about I’m sure you can guess what her answer is…………..SHAPES! We were in Publix the other day, and I told her she could pick out a treat for being so well behaved at the store. She told me she wanted marshmallows, the little ones. Ok……….I’m not one of those Moms that refuses to let her kids have sugar sometimes but I am that Mom who feels the need to combined a once in a while sugary treat and an educational activity. That way we all win. She gets her treat and I feel better about giving it to her. On the way home from the store I thought about what I could do with the marshmallows. It took me a few minutes, but then it came to me! Grace could build 2D shapes out of marshmallows and toothpicks! We just bought marshmallows, and I had toothpicks in my pantry. I was convinced this was going to be Grace’s favorite activity yet and guess what, it was! This preschool STEM activity took about 5 minutes to set up, and Grace stayed busy for a good 30 minutes. Ok, I know you’re excited about this activity so let’s get started! The first thing I did was go over all the shapes (linked above) with Grace. I had her tell me the name for each shape. Then we talked a little about what makes each shape different. After that I told her she was going to make each shape out of toothpicks and marshmallows. Tip: Before we got started I let her eat 5 little marshmallows. This way during the activity she wasn’t worried about when she was going to get to eat a marshmallow. I also told her when she was finished she could eat 5 more. I didn’t show her how to make the shapes with the toothpicks and marshmallows. I wanted her to try and figure it out on her own. I just guided her along as she figured it out. Once she did the first one, there was no turning back. She loves it and continued to make all the shapes on her own. It was amazing! How did my daughter do with this activity? This was most definitely one of her favorite activities of all time! She was focused and so excited. I was also impressed that she figured out how to build the shapes with the toothpicks and marshmallows on her own. The toothpicks I had in my pantry were the colored toothpicks. As Grace was doing this activity I also noticed she was color sorting the colored toothpicks as well. She would use only one color to build a shape. This was also very cool to see! I love when an activity comes together and is way better than I thought it was going to be! 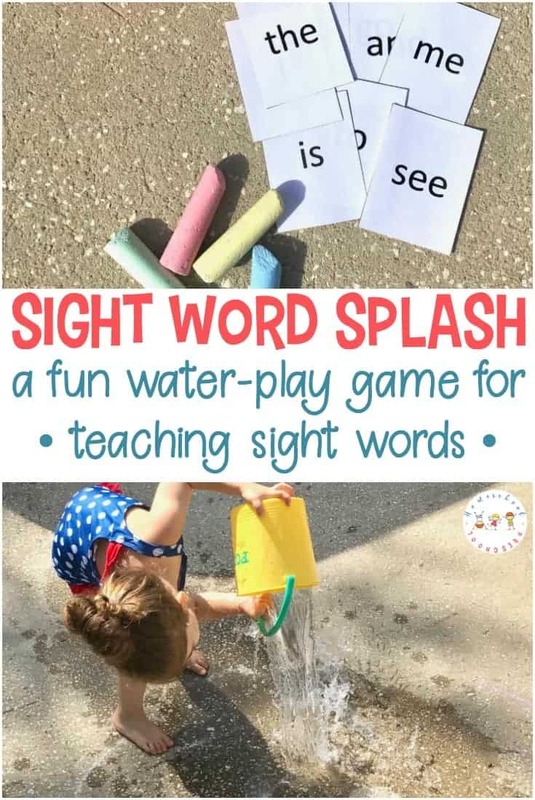 There are so many things that can be done to extend this fun and easy activity. 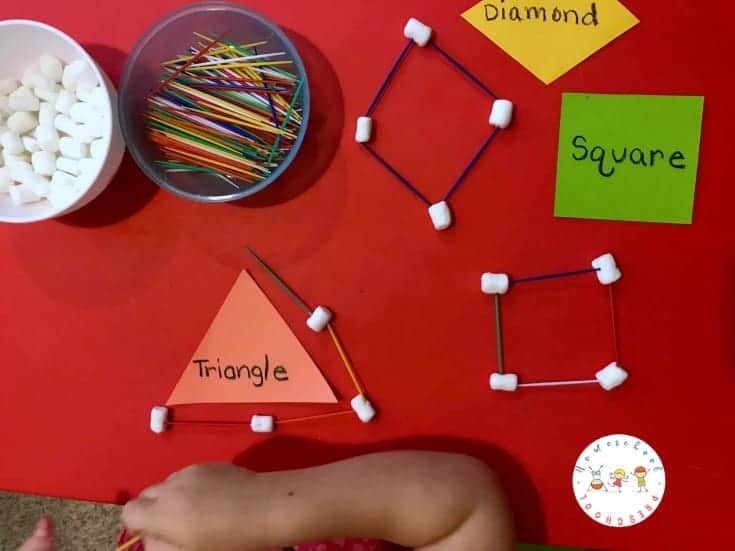 You could ask your child to build a structure and see if they can figure out how. 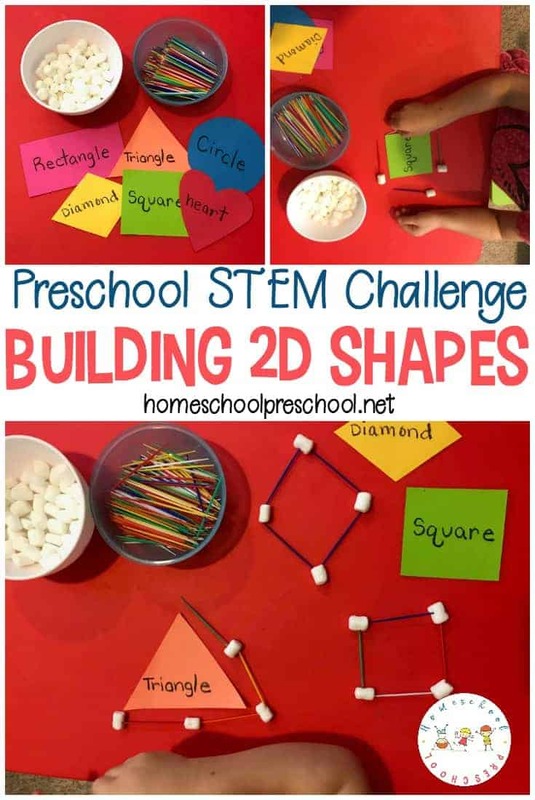 This Building 2D Shapes Activity is amazing! Grace had the best time and I really enjoyed watching her during this activity! We will definitely be doing this activity again! I hope you and your child enjoy it as much as we do! Hello there! I’m Jayme, a former elementary school teacher turned busy stay-at-home-mom of 3 beautiful girls.I decided to start Teacher Turned Mom as a way to help others and keep my two youngest girls busy.I also love to share fun, simple, and education activities for everyday learning.For lots of great kids activities check out my website at www.teacherturnedmom.com. 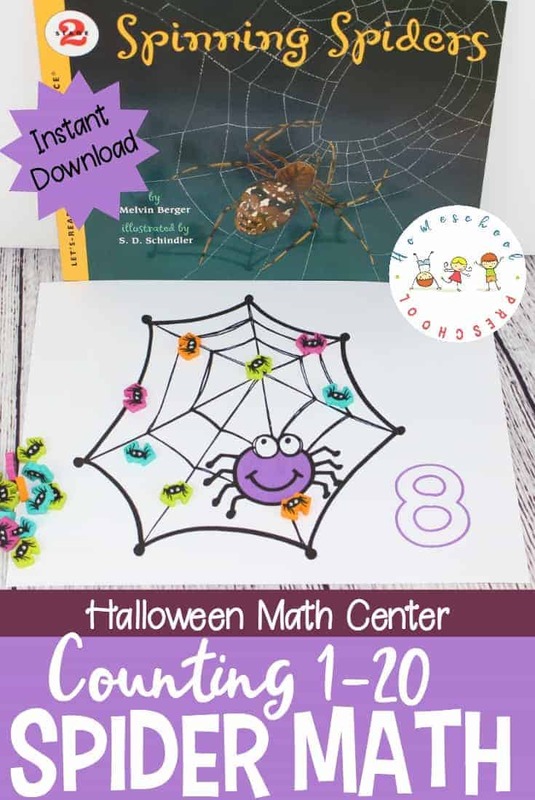 sure wish there were math lessons and activities around when I was in school!